The funnel chest or pectus excavatum is the most frequent anterior thoracic malformations. It causes deformations and an important aesthetic discomfort and very little functional discomfort except in very developed cases. Its surgical treatment allows a significant improvement in quality of life. – Sternochondroplasty: it is practiced by thoracic surgeons and consists in modifying the structure of the cartilages and sternum by sections stabilized by titanium plates. This is a complex and painful procedure. It is intended for patients suffering from a significant functional respiratory impairment (discomfort). A minimally invasive technique known as Nüss consists in introducing a convex titanium rod into the thorax to project the sternum. It is interesting in types 1 and 2 during the time of growth between 13 and 18 years, but can lead to life threatening complications (migration of the Ness Bar into the heart). Modified Ravitch procedure is now the most performed surgery in cases with functional impairment. – The placement of a custom-made silicone prosthesis: this is the intervention we carry out. It is intended for patients suffering from a purely aesthetic discomfort that corresponds to most cases. It consists in introducing under the skin or under the pectoralis muscles a solid silicone prosthesis (no possibility of rupture of the implant like in a silicone gel filled breast implants ). 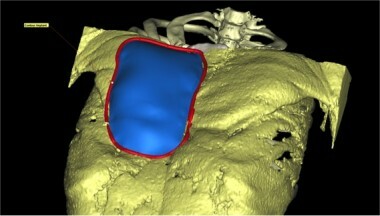 The correction of pectus excavatum by silicone prosthesis has recently been revolutionized by the application of computer-assisted design techniques. Indeed previously, the implant was made from a plaster mold made by application of alginate (paste borrow used in dentists) on the thorax of the patient by a specialized technician. This method had its limits, especially for women (the volume of the breast prevents the taking of a reliable borrow), and in types 3 of Chin. We now only use methods based on the creation of 3D models from a reconstruction volumetric scanner of the patient. This method allows an adaptation to the millimeter of the implant to fill the area. The implant is then manufactured by the SEBBIN laboratories in solid silicone elastomer after the case study by Anatomik Modelling. It does not present a risk of rupture and its lifespan is estimated to be more than 25 years. It is placed under endoscopic control (using a camera), most often under pectoral muscles. A first consultation with your surgeon is necessary to explain the risks and the benefits of such intervention. A chest CT scan will be prescribed and a quote from Sebbin Laboratories will be given to you. A specific compression garment will also be prescribed. This scanner should be analyzed by your surgeon and sent to Anatomik Modelling to organize the plan and production of the implant. This stage lasts usually 2 months. Finally, a pre-anesthetic consultation must be carried out at least 48 hours before surgery. A low risk of a hematoma (blood clot in the operating room) is possible within 48 hours of the operation. As with any implant, postoperative infection is rare but possible (less than 1% of cases). We then must remove the implant and set an antibiotic treatment. The most frequent complication is the occurrence of an effusion of lymph that occurs in every cases. It requires multiple punctures. The edges of the implant may be visible especially in very thin patients. A correction by injection of purified fat can be considered in a second phase. What steps should you take before considering of a funnel chest surgery by custom-made silicone prosthesis? A first consultation with your surgeon is necessary to explain the risks and benefits of chest surgery. A chest CT scan will be requested and a quote will be issued by Sebbin Laboratories after a medical prescription. A deposit of about 1000 € will be requested before starting the manufacture of the implant. This scanner will then be analysed by your surgeon and transmitted to Sebbin laboratories for planning and production of the implant. This stage lasts on average 2 months. Finally, a consultation with your anesthetist will be carried out during the month preceding the intervention. Is the intervention covered by health insurance? Yes, the customized surgical implant of silicone implant is covered by health insurance as well as hospitalization. However, the implant itself is not covered and its cost varies between 1200 € for an implant made after molding with 2300 € for an implant designed by computer from a scanner. A deposit check payable to the laboratory SEBBIN will be requested before starting the manufacture of the implant. Finally, the fees of surgeons (2500 €) may be reimbursed by your complementary health insurance. How much does a funnel chest surgery by custom made silicone prosthesis cost? If the health insurance covers the charges, our surgical rate goes up to 2500 € possibly taken in charge by your complementary health insurance. The implant is not covered by health insurance or by your complementary health insurance company. Its cost 2300 Euros. Hi, there is no surgeon listed for this technique in South africa. I think you will to come to Europe to do it. We can plan a skype consultation et design the implant before your travel to Europe if you want to. Hello.can I have a question about price 100 precent private pectus operation ?? ?